THE 14 FOOT MOBILE • THE 22 FOOT MOBILE • WANT ONE? Is This Cool... or What? 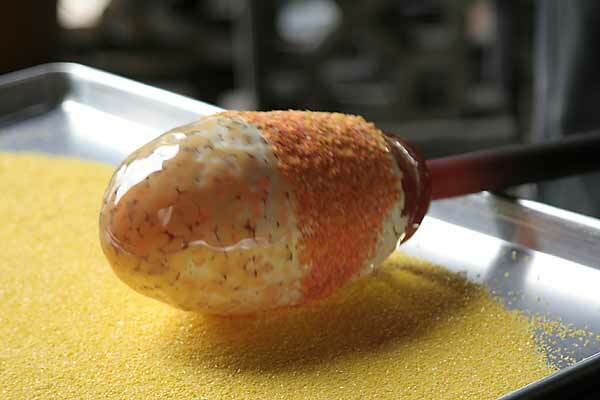 After you've donned your safety equipment and have plenty of water and a few snacks handy to keep yourself from passing out, you gather a big ball of 2,200° glass from the furnace and roll it in pulverized glass of various colors and sizes to add the desired colors to the work, reheating and melting in each time as you go. 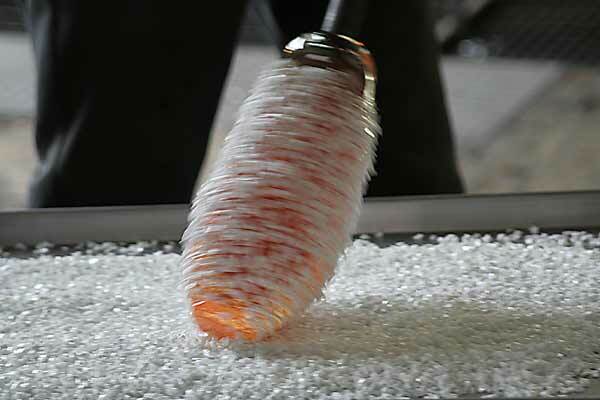 Then, through many stages, you shape and increase the diameter in a manner that maintains a constant wall thickness. Adding different colors makes the process difficult. More difficult than most would think, as the glasses gain and hold heat differently from one another. Some sections will be more liquid than others, some are stiffer and resistant to movement; this affects the shape and what you can do with it. This requires the Gaffer's and the Assistant to maintain constant attention and pre-planning, else the piece will not become a success. Concentration throughout the process is imperative. It is a dance, a performance that has a progression. 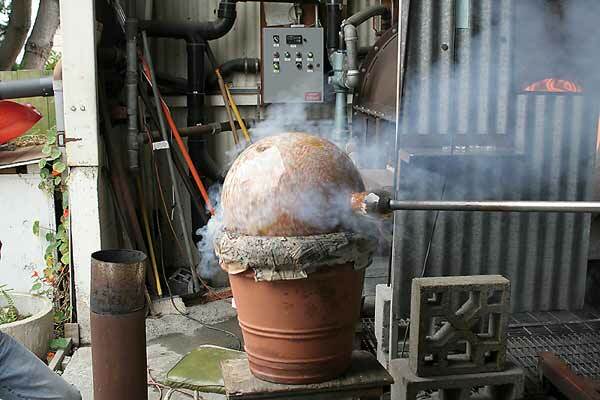 If you are off in timing, miss a step or do not gauge the heat correctly, the piece is lost. Sometimes, it takes days to develop the right sequence. That's why we maintain a journal; to remember what worked. 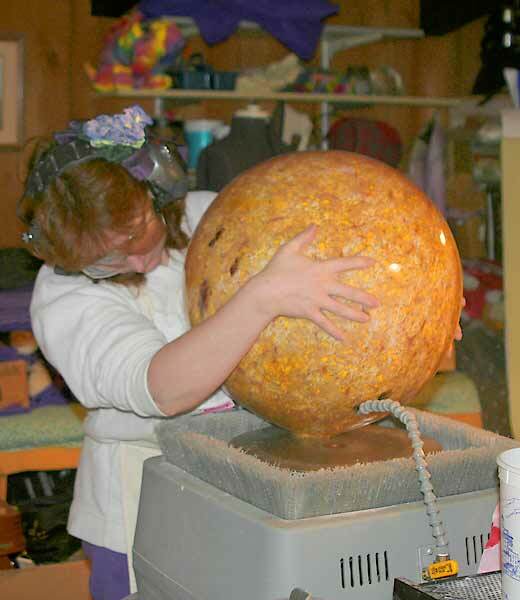 Hemispherical wet wood blocks of increasing sizes or moist newspapers are used to control the shape as the sphere grows larger. The moisture creates a layer of steam when brought into contact with the hot glass; dissipating the heat. A layer of carbon is built up allowing the artist to use his or her hand almost directly upon the work without getting burned to impart more organic shapes. 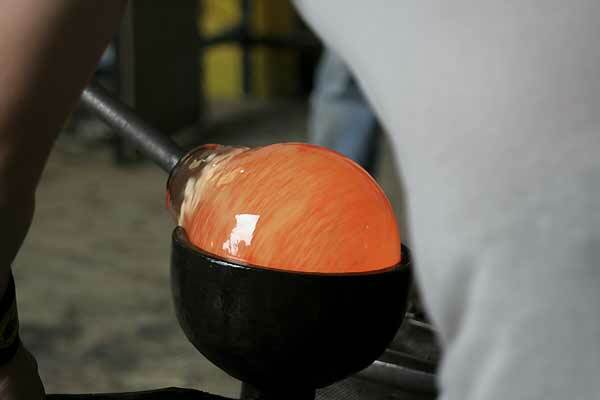 When doing this, you can feel the softness in the glass as it moves under the pressure of your hand and fingers. 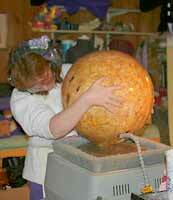 Many re-heatings are done to bring the sphere up to the desired size and shape. If it is re-heated one too many times or you go too hot, especially when the wall thickness drops below a certain amount, suddenly it will implode and you start over. If the work is a success, it goes into the annealer oven to very slowly cool at a controlled rate over a period of many hours. The next day, you find out whether it survived and how it looks. 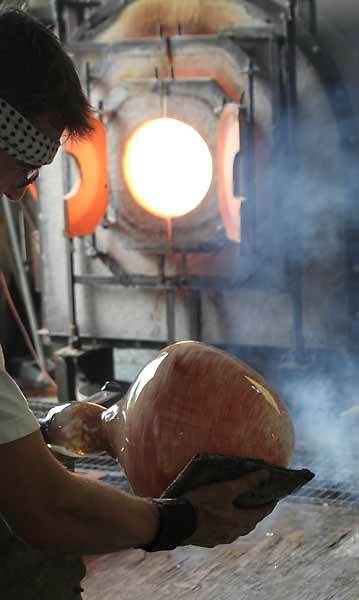 Glass colors are quite different when hot, some remarkably so. The artist must remember what it looks like when cool while working with it at temperature. 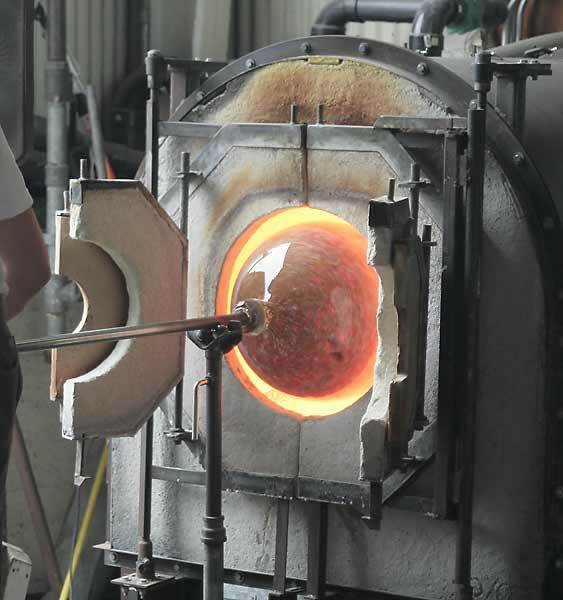 Once at room temperature, the cold-working begins; grinding and polishing on succesively finer water-cooled diamond wheels, removing the glass that remains after the work was "cracked off" the pipe or the punty. It is a slow, painstaking process, taking many hours until the final shape is as intended. 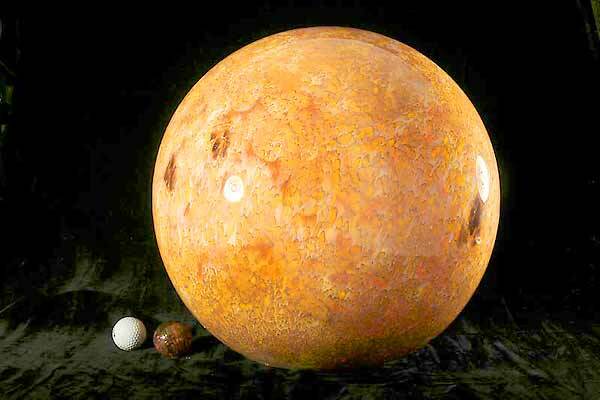 The finished Sun and planets for one mobile are lined up with a golf ball for scale. The magnificent light transmission through the backlit Sun and how it differs from the one lit from outside is remarkable. Really looks like it's burning. Mars has prominent polar caps on its rusty surface. Venus shows the coriolis cloud pattern. 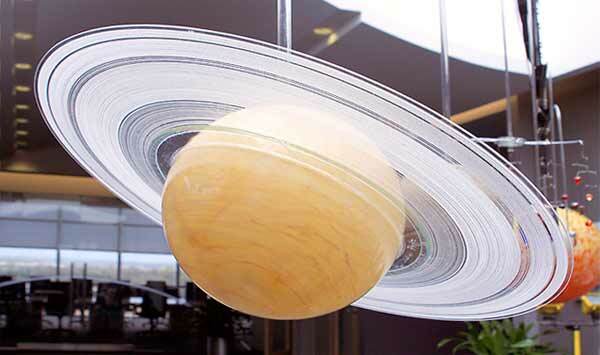 Saturn is shown as installed with its rings. Just doesn't look right without them. The subject often comes up. When dealing in the astronomical, true scale is just not practical. We'd like to build one of these that does exhibit true scale but the distances and sizes are too vast. 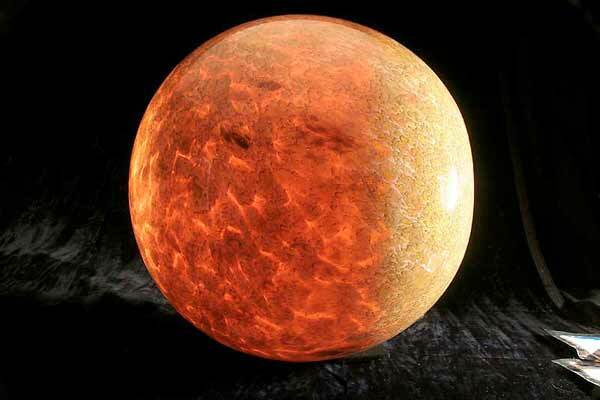 Given the Sun at its present diameter of 17 inches (43.2 cm), Mercury is 59 feet (18 m) away and 60 thousandths of an inch (0.060" / 1.5 mm) in diameter. Earth would be out in the parking lot at 152 feet (46.33 m) and Mars would be in the street 232 feet (70.7 m) or greater than 3/4 of a football field away. Pluto is 1.13 miles (1.82 km) out, the size of a dust mote. Not a lot to see. To that end, we adpoted a relative scale. The rocky planets are relative to each other and smaller than the gas giants. 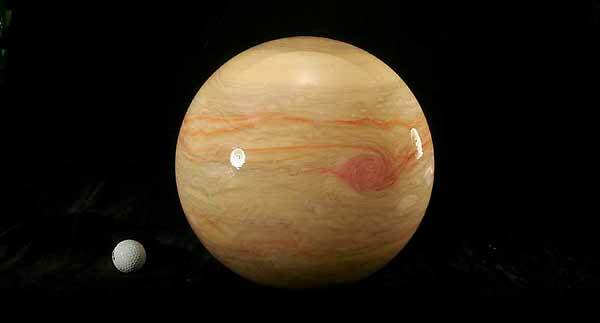 The gas giants are relative to each other and significantly smaller than the Sun. What you see here are the reasons that we choose glass over all other materials. It is unmatched in its beauty and there's just something about it.